Ombient has heard night eating the world, and converted this energy into sound. Taking the listener into null space the extraordinary Electronic Musician Mike Hunter observes an odd parade of angels and demons that check in and out of his nightmarish sonic space. Adding to a restless and vast body of work now comes The Wings of Halphas (59"00'). It will do us no good to leave a light on while this piece plays, because if timbre is thought of as the color of sound, then this album is black enough to absorb the light of any respectable listening area. Here the idiosyncrasies of Hunter's gear are cleverly enlisted, so you are advised to ready your sub-woofers for the ensuing sound system workout. With crackling circuitry searing electronics, the conventional access points of rhythm, melody and harmony are closed off - as The Wings of Halphas presents an experience of sounds, tones and organization that will be completely unfamiliar to any audience. In Ombient's uncontained void, distortion is a welcome character. With its ripping texture, and red zone saturation, it bestows a sense of surpassing limits - in service to this composition's ever-present feeling of lost abandon. The fire of a rumbling furnace draws air in hissing discontent, to issue the leaden fumes of this grinding industry. Raw chords inhabit the cellar, cowering before the grinding oscillators and crumbling modulations occupying the upper air. Something more than drones and tones inhabit this seemingly unending track. 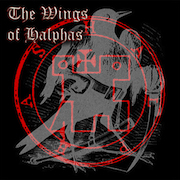 Probing, bitter, sharp, emotionally charged, yet burning cool The Wings of Halphas expresses more than the surface reality of sound. 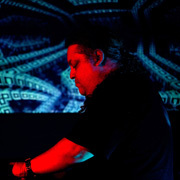 It digs down below - because from out of the subterranean realm does come the inspiration for this kind of music. In Ombient's demanding world dense auricular forms do frustrate our dreams of escape - so conjured by a particular, inquisitive mind. Like waking from darkness, into a dark time, we wonder if we will ever find our way out? But for all its devils and darkness, this realization came into being out of the simple pleasure of making music, of following where the creative process leads - in hopes of working the minds of both the player and the listener.